This week I’m going to pull that seemingly forgotten 3/4 full bottle of calvados off my shelf and mix up the inventively named Calvados Cocktail. Per Dr. Cocktail this drink first appears in the 1930 Savoy Cocktail Book. Though, for an easier to read recipe I’m going to use the one from Vintage Spirits and Forgotten Cocktails. It’s the same recipe proportion wise, just adjusted for a single cocktail. Okay. Read that recipe again. Did you catch it? That’s right, this drink calls for a full three quarters of an ounce of bitters! Holy crapola! I’m used to measurements of bitters like 3 dashes. This, my friends, is going to be very entertaining. 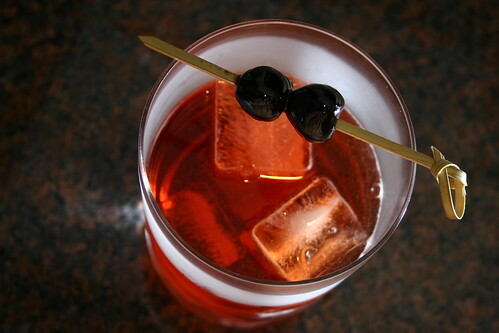 Named after The Paris Boulevardier, a magazine printed in Paris for expats and modeled after The New Yorker, this cocktail is another from the pages of the fantastic Vintage Spirits and Forgotten Cocktails. 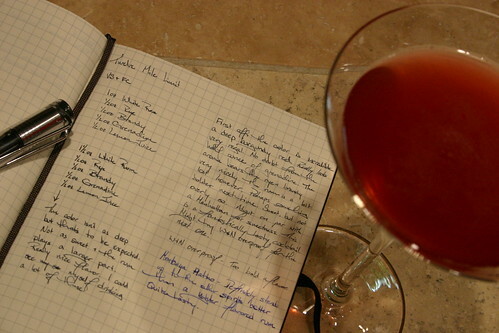 The Boulevardier is clearly related to the Negroni, but what’s really interesting is that this recipe was printed 20 years before the first printing of the Negroni. That’s not to say it didn’t exist, but it can be assumed that the Negroni hadn’t gained the same popularity as this week’s drink. It’ll be interesting to see how the bitterness of the Campari works with the bourbon in this mix. Seeing as I’m a huge fan of the Negroni, and Campari in general, I’m sure it will be tasty. There’s no doubt that the lawmakers got a lot of things wrong during Prohibition. The bartenders, on the other hand, were right. The Twelve Mile Limit definitely exemplifies that statement. The drink is well balanced, extremely flavorful and, overall, tremendously pleasing. In this week’s picture I decided to share a bit of my insanity in the form of my cocktail notebook with you. So, on that note (pun fully intended), I’m going to let my notes do some talking about this drink. “First off, the color is incredible, a deep burgundy red. Really looks very regal.” And that it absolutely does. This drink uses a lot of grenadine, at least in comparison to the amount you typically see in cocktails. I, of course, reached for my homemade hibiscus grenadine. The result is a deep red that is truly striking. “The aroma bears the rye and brandy very nicely. The rum is a bit lost however.” Again, very true. Though I think there are a couple reasons for the rum getting a bit lost. First, the rum I picked at first (Flor de Caña) is very smooth, but also quite light. This drink definitely needs a bit more boldness. So, to change it up I tried Wray and Nephew Overproof for the next mix. Wrong answer. The alcohol flavor was much too bold. For try number three I reached for a rum recommended by Rum Dood for this drink, Montanya Platino. The fact that Montanya is a Colorado rum is just icing on the cake. The Dood was definitely right, this is a great rum for this drink. Though it was still a light for my tastes. So, let’s talk about that second point. I think the rum can be bumped up a bit. For my preferred recipe (below) I increase the rum to 1 1/2 oz which brings its flavor more to the forefront. A couple quick notes on this recipe. First, by adding more rum I’ve pumped the alcohol content up to 2 1/2 oz. That puts this drink solidly into the formidable foe category. So, like most formidable foes, be cautious in your consumption. Second, that extra 1/2 oz also lessens the depth of the red color a bit. I’m okay with that. Adding more grenadine is an option, but I’d rather not have that additional sweetness, so I go without. A final bit of discussion, the Three Mil(l)er. I tried it and I’d like to call shenanigans on myself. This drink is certainly related to the Twelve Mile Limit and it may have come before, but the relationship is more that of an older cousin than a parent. I mixed up the Three Miller recipe from the Savoy. It’s much drier than the Twelve Mile Limit, but that’s to be expected since the only sweetener is 1 tsp of grenadine compared to 3. The lemon juice flavor is really only an accent; at 1 dash you don’t even pick up the sourness. Lastly, with 1 1/2 oz of brandy and 3/4 oz of rum this drink is all about the brandy. It’s the center of the aroma and the flavor. So, while related to the Twelve Mile Limit, this drink is a completely different beast. Still worth trying though. In my meanderings about the internet looking for information about Prohibition, territorial waters and the like I was directed to The Chemist’s War, a recent article on Slate.com. “The Chemist’s War” discusses some Prohibition history that was not only completely new to me, but also more than a little distressing. Not to give away the article (you really should read it, it’s quite good), I think we are all aware on some level that industrial alcohol is denatured. Denaturing alcohol, usually by adding methanol, makes it undrinkable. Nothing particularly new there. Though I bet you didn’t know that during Prohibition the US government forced producers to increase the additives thus making these products even more poisonous. Still not hugely scary. How about the fact that it caused over 1,000 deaths in New York alone? Got your attention? Read the article for the twisted but fascinating details.